Meet the festival’s Afro-Panamanian founders ahead of this weekend’s celebrations in New York. Back in February, in a cover story on J. Balvin for The FADER’s Global Issue, writer Marlon Bishop recognized an important but sometimes overlooked point in reggaetón: Balvin’s whiteness may have helped his career. “Racism is very different in Latin America,” wrote Bishop, “but it’s no less insidious.” Even though reggaetón was invented by black Panamanians in the 1980s and was inspired by black Jamaican dancehall music by way of Puerto Rico, Latin American reggaetón artists who find commercial success are overwhelmingly white. An event trying to challenge that is Afro-Latino Festival. In the years since its debut in 2013, it’s helped create a space for Afro-Latinos in New York City to appreciate the African influence on Latin American culture and black Latino artists. 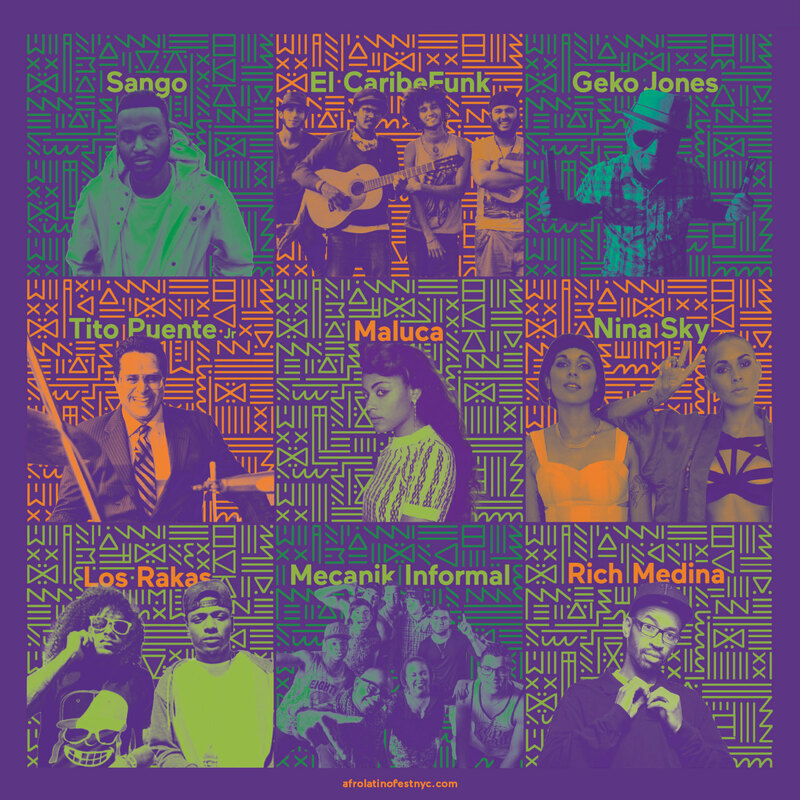 This year, for example, you can catch Panamanian rap-duo Los Rakas, Cuban electronic fusionist DJ Jigüe, and New York City rapper Princess Nokia during the three-day showcase. The festival was started from scratch by Mai-elka Prado and Amilcar Priestley, an Afro-Panamanian couple based in New York City, and has since grown to include talks, presentations, and sets that work in collaboration with local, national, and international groups and movements. This includes their ongoing support of the United Nations initiative “International Decade for People of African Descent,” which will be celebrated in part this year through a keynote talk at the festival from Ahmed Reid Springer. I spoke to Prado and Priestley over the phone, a day after their child was due to be born, about how they created their festival to honors the African-influenced rhythms, melodies, and dance of Latin America. Why did you start the festival? MAI-ELKA PRADO: First and foremost, it was important for me because I realized there weren’t events that concentrated on Afro-Latino music, influence, and organization. In New York there was no space in the open air for this. There are a lot of cultural events that celebrate culture but for us Afro-Latinos there weren’t any. So we started working on really putting this need into our lives. We had different non-profit organizations that were doing work with Afro-Latinos and making sure this event exists. We started in Parkside Avenue close to Prospect Park, as it’s really small, and little by little we started to grow. Our line-up has been tremendous — it’s grown a lot just last year to this one. Why was it important to do this festival in New York City? PRADO: This is the center of the situations, right? Here we can find the problems of all the different countries, and we can find Afro-Latinos from every country of Latin America. So that’s a huge window. It’s like a perfect niche to begin planting the seed of knowledge, understanding, and recognition of black people in Latin America. This is the place to do it, and luckily, we’ve started here. AMILCAR PRIESTLEY: Last month a number of communities recognized Black History celebrations. So in Guatemala, Nicaragua, Honduras, Coasts in Costa Rica and Panama they were celebrating Maypole. You had the Dia de la Afro-Colombianidad which was May 21. You had Dia de Las Trenzas in Panama, which was Day of Braids, and Haitian Flag Day. Also June 4, we had National Afro-Peruvian day. This festival, on my end, is an important platform that aims to connect the dots between the socioeconomic, political, cultural, and spiritual, in the best way possible and engage the community. Folks were very excited that it was happening, they felt like it was long overdue. So it's an exciting opportunity to be able to push the conversation forward, especially when the younger generations are becoming more interested. There's a re-awakening amongst folks who may or may not have been aware of the past, and it will help re-invigorate those who have been doing this work for a long time. To see new generations coming in, carrying on the conversation, moving the conversation forward. That's what we're trying to do with the big symposium at the Schomburg [Center for Research in Black Culture]. Can you talk more about your partnership with the Schomburg? PRADO: We’ve incorporated another element this year, which are conferences that we call “The Afro-Latino Talks.” Through these [talks] we are giving the festival another power. It's not only about dancing and partying, but also about [giving space to] themes that are important we talk about. We have to create consciousness amongst ourselves and with the public. I think that as community organizers of this cultural event, we have the responsibility, before anything else, to show the Afro-Latino voice and to highlight the presence of Afro-Latinos in New York. We need to make that connection between Afro-Latino communities here and in Latin America. In one way or another, we all return. We all go to visit our grandmothers in our countries. That’s part of our culture, so this link cannot be cut. Can you talk about the problems in Latin America that led to you creating the festival? PRADO: We all know that African culture and influence in Latin America has been erased throughout history, and this event is helping change that. Through getting to know each other, working together, and sustaining communities in our international networks. That’s important — we have to make change to move forward. The person who knows their country and their culture knows that in, one way or another, there’s the African influence — the task is recognizing it. For example, how do we decide to label that genre of music? Even though we don’t see it and it’s not promoted on a large scale, it’s not recognized for what it is — having African instruments, dance, and influence. This festival isn’t only for Afro-Latinos. It’s for Afro-Latinos but also for whoever makes or uses that type of music, so that they respect and honor AfroLatinidad within their work. And that’s our work. It’s our labor — through communal inclusion, we hope to shine more light to the idea that we are invisible, but we need to find our spot. What are some of the music genres that you're trying to reclaim? PRIESTLEY: In Colombia we have champeta. There’s bullerengue, which is a type of traditional music from the Palenqueras regions. You can also find bullerengue in Panama. The music of communities in the islands of San Andres, provinces of Santa Catalina, are also of Afro-Caribbean influence — creolle, soca, calypso. Tango, the dance and the music of around Chile and Argentina, comes from African influence. What artists do you have this year? PRADO: We have an initiative that we’re proud to start this year. We're working in a partnership with the United Nations to celebrate and get to know a different black community in Latin America over the next 10 years. This year, we are dedicating part of the show to the Afro-Panamanian community. So because of that, this year we have Los Rakas headlining, who are from California by way of Panama. We’ve seen the progress of this festival, and Los Rakas is a testimony to how perseverance pays. What are some of the challenges you've faced in putting on the festival? PRADO: Everything has been difficult in one way or another. We had to start from zero for a concept that did not exist. In [Afro-Latino] communities, opening the minds of people about the different concepts that the festival promotes is not easy — but it’s not impossible. We’ve been fortunate enough to be within communities and have organizations that are willing to work with us. Of course, the funding for the festival takes a lot of time. We have put together our own, but raising funds to support the festival has been challenging. And what about the successes? PRADO: So many. We have successfully brought together thousands of people. We have grown from just one day on a corner in Brooklyn, to three days in Harlem, Brooklyn, and activities in The Bronx and Queens We’ve invited international artists. And the concept has grown tremendously. That’s the greatest achievement — to see the fruits of our labor. Every year there are more people supporting the festival and offering their hand. It’s so satisfactory for us not to feel like we are just one voice, but that we have the support of people and observers because of our perseverance. 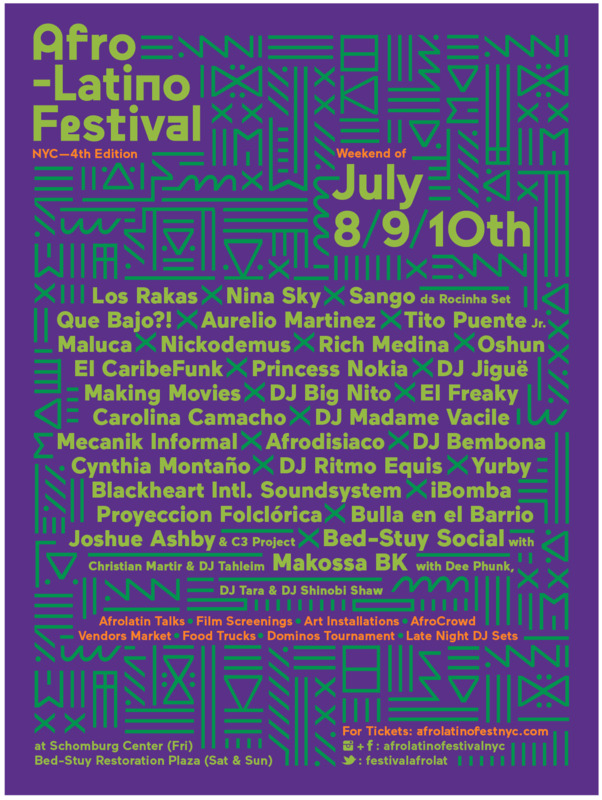 Afro-Latino Festival will take place this July 8-10.